Connie Prince Digital Scrapbooking News: Marvelous Monday winner, sales and a freebie! Marvelous Monday winner, sales and a freebie! I hope everyone had a nice and restful holiday weekend. Did you play last week's Blog Game on Wednesday? Congrats to Zanitha! Connie will be sending you a coupon! Do you want a chance to win a coupon to Connie's store? Please come back on Wednesday to have another shot a winning! Connie's new Grab Bag is only $5.00! You have until Wednesday to get this fabulous kit and extras before it's split up! Available at Gingerscraps, The Digichick, and Digital Scrapbooking Studio. 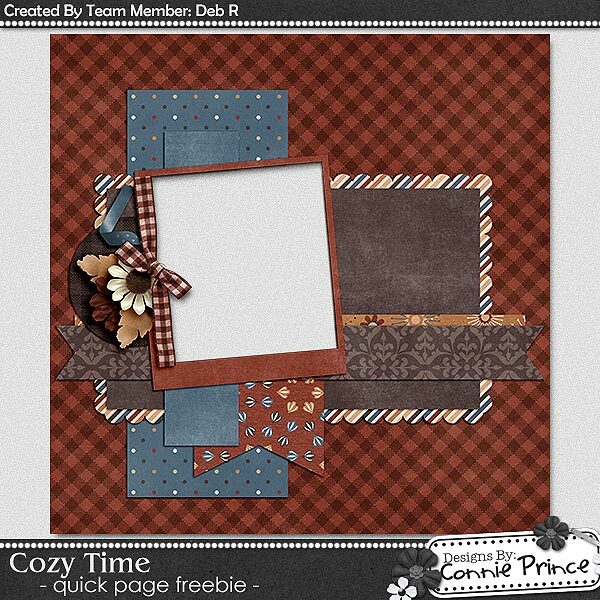 Deb R. Made you this fabulous Quick Page using Cozy Time! Thanks for the great QP!